I recently obtained this vintage 1920s era postcard photograph from Knightsbridge Antiques in Northville, MI. It is one of the largest antique stores in the area. I've only recently discovered it. I foresee hours of browsing there in my future. This photograph was from a rather small box in a much larger display booth. Most of the photos in this box appeared to be of European origin. Several of them, including the above, appeared to be from Germany. All seemed to be in the World War II era or earlier. 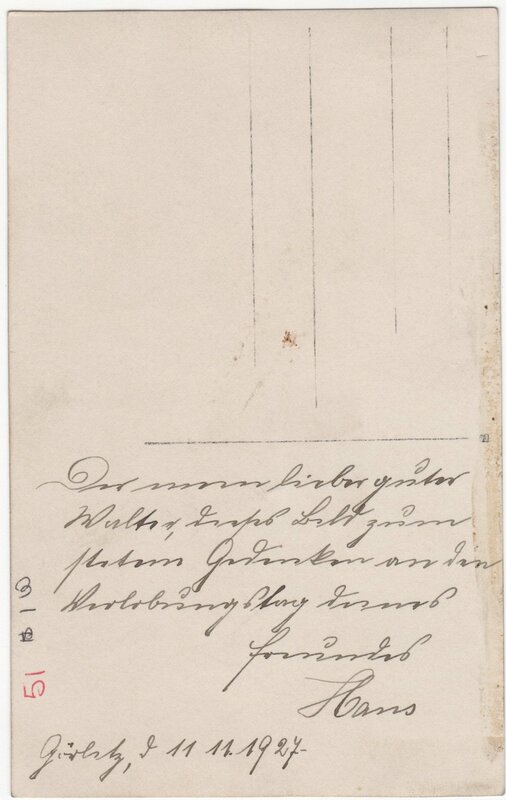 Here is the back of the photo with an inscription in a language that I did not recognize. Given the other photos near this one, my guess was that it was German. everlasting memory of the engagement day of your friend Hans. So, what we have appears to be a 90+ year old photo of an engagement party in 1927 Germany. It is a little unclear, but it seems that the party was in the city of Gorlitz, on Germany's East side bordering present day Poland. Presumably, the man and woman sitting in the center are the engaged couple. It is a little unclear if the man mentioned is Hans or Walter. Or, I suppose it could be someone else entirely. My best guess is that the other people in the photo are a mix of family and friends. I am not sure what 1920 German engagement customs were, but I see a ring on the man's left ring finger. Is this a wedding band? I see a similar ring on the woman's right hand. I can't tell for sure, but her left hand looks ringless. What do you make of it? It seems unlikely that there are enough clues here to identify anyone in this photo, but it is worth a shot. In the meantime, here are some questions I encourage you to think about. Who is the couple celebrating their engagement and what is their story? What do you notice about the room decor? What do you think, feel, and wonder about as you look at the faces in the photo? What was the cultural and political climate in 1927 Gorlitz, Germany? What do you imagine happened to Hans or Walter? Is there anyone alive today who might recognize someone in this photo?